Liquid ready to smoke Bye Default CoffeeAvailable content: 10 mlProduct without nicotine (NICOTINE F.. 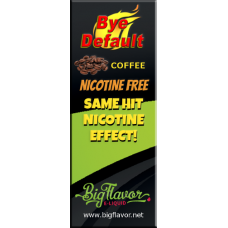 Liquid ready to smoke Bye Default Coffee CreamAvailable content: 10 mlProduct without nicotine (NICO.. Liquid ready to smoke Bye Default ColaAvailable content: 10 mlProduct without nicotine (NICOTINE FRE.. Liquid ready to smoke Bye Default DesertAvailable content: 10 mlProduct without nicotine (NICOTINE F.. Liquid ready to smoke Bye Default Energy DrinkAvailable content: 10 mlProduct without nicotine (NICO.. Liquid ready to smoke Bye Default MangoAvailable content: 10 mlProduct without nicotine (NICOTINE FR.. Liquid ready to smoke Bye Default Max BlendAvailable content: 10 mlProduct without nicotine (NICOTIN..